Wind blowing through your hair, rolling through the streets effortlessly as you glide and swerve your way around. Cruising on a longboard is the pinnacle of freedom when it comes to skating. Often associated with sunny skies, cruising by beach fronts, and having a ball with your friends, longboard cruising offers an excellent feeling of freedom. This type of skating is perfect to do on a nice trail through a park, or when you’re just hanging out and enjoying your time on the board. 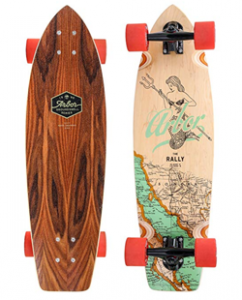 Usually, any type of board can work well for cruising but if you’re looking to do cruising and a little of something else there are tons of different boards to pick and choose from. When it comes to finding the right type of board for your needs, it can be tricky and overwhelming at times to know where exactly to start. Luckily, we’ve compiled 5 of the best longboards to fulfill a variety of different tasks and needs. Happy skating! If you’re planning on travelling long distances with your board to work, college, school etc you’re going to want a stable smooth and reliable board to get you there and back. Mainly, you’re going to be looking for a board with great push-ability and riding comfort that provides a safe and smooth ride. We’re huge fans of the Arbor brand as a whole. 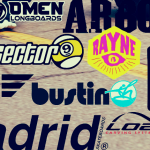 Arbor and Sector 9 are featured on this list, as well as our best longboarding brands list. The Arbor Rally cruiser is the perfect size and shape to make all the tights turns and corners in urban areas when commuting. Light weight and strong, this board provides a stable and comfortable ride over varying inconsistencies that may be on the path/road. With great bearings, big soft wheels and a reliable strong 7ply maple deck – this board has the hallmarks for an amazing commuting cruiser board. The board has the bonus of being created from suitably resourced and recycled products – sounds like the dream board we all need. When it comes to carving you’re going to want a longer board with a wider base and maneuverable trucks to give you confidence and stability when carving down a winding slope. 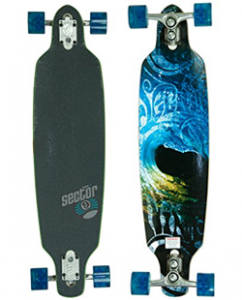 The Sector 9 lookout complete setup is a stand out board that is perfect for the job. With 74mm 78A wheels, abec 5 bearings, a drop through mount and 5 ply laminated bamboo deck – this board is built with a reliable set up guaranteed to give you the best feeling ride and carving that you could possibly want. Everyone loves to pull off a couple of nice tricks every once and a while, and to do that on longboards – freestyling would be the way. To freestyle on a board, you’re going to need stability, space and flexibility in the board to confidentially cruise around and impress those around you. The Magneto freestyle downhill board provides you the perfect opportunity to freestyle and dance away to hearts content. Made from 100% bamboo flexible fiberglass this board provides a smooth and stable ride that’s perfect for carving, tricks and cruising. It has 7’’ heavy duty aluminium trucks that are sure to last a long time and provide a comfortable and reliable ride when craving and taking sharp turns. The board measures at 42in x 9in which gives you plenty of space to move around when freestyling. Each side of the board is finished off with subtle kick tails providing you the opportunity to pull off even more types of tricks and fun – what doesn’t this board do!? We definitely deem this board as one of the best longboards for cruising and freeride as well. If you’re cruising around on flat ground the best type of board would be something that’s easy to push, fun to turn, carve and can glide across the ground with ease. 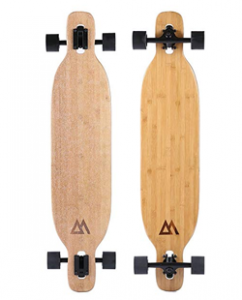 For cruising flat – you would almost be better at looking for an electric powered longboard, but often these are expensive and pricing in at $1000+. 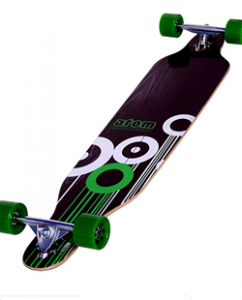 The atom drop through 41 inch is an ultra low riding longboarding with ABEC 9 bearings which will give you a super smooth ride and you’re guaranteed to be gliding across the concrete for ages. It’s made of a full maple laminate deck which is strong and reliable that’ll absorb all the bumps and lumps you might riding over in the future. 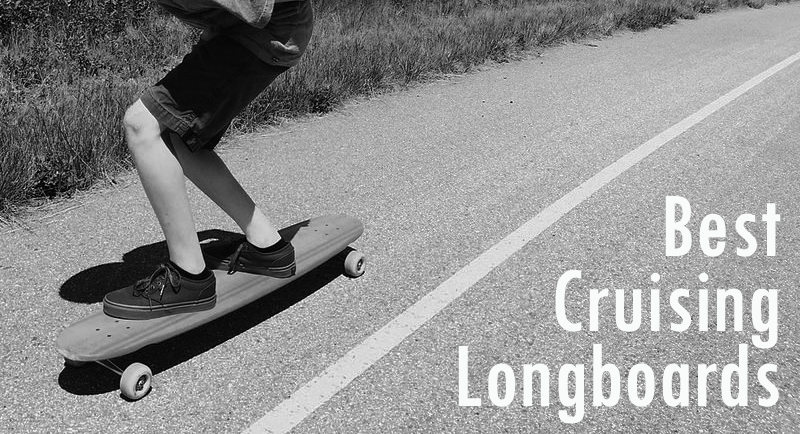 Longboarding is generally quite easy and very fun to pick up for first timers. However, it’s essential to make sure you start off with the correct type of board to make sure you’re giving yourself the best chance at having the best possible ride. Beginners, should generally be looking for a board that has a strong and reliable deck, durable trucks and wide soft wheels to grip the road. The board should be long and wide to give a ride that is as stable as possible. While there are a lot of boards and companies out there – it’s always best to look for and buy a quality board to make sure it’ll last you throughout your longboarding journey. We’ve chosen the Aperture as one of our top 5 best longboards for beginners, and we can’t recommend it enough. 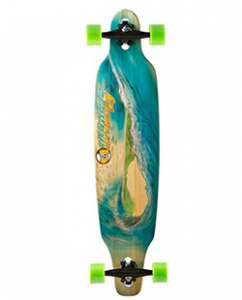 The sector 9 aperture sidewinder is priced decently and has all the key characteristics a beginner long boarder should be looking for in their board. 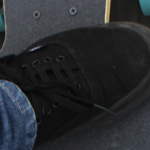 Made from a longboard brand with a longstanding history of producing quality boards – the wide base and soft big wheels provide the perfect opportunity and challenge for a beginner to start skating and then to soon transition onto gaining more speed and developing their longboarding ability. Reviewers have deemed this one as one of the best longboards for cruising and speed and we couldn’t agree more. The Aperture is also one of the best longboards for sliding, if you’re able to add harder wheels. While we’ve gone through and shown a couple of different longboards and their many uses – it’s always good to know that longboards are highly customizable and adjustable. Any board can have its trucks, bearings, and bushings changed if need be depending on what you’re after. With all the possibilities and combo’s in the world there’s nothing that’s stopping you from making the best longboard for cruising around. If that interests you, be sure to go check out our other articles on the best longboard wheels for cruising and sliding.